The twenty-third United States Census, known as Census 2010, was the most recent national census. The population of the United States was counted as 308,745,538, which is a 9.7% increase from the 2000 Census. This information is u sed for many purposes. First, it is used to allocate elected seats, not only in the House of Representatives, but in the state legislatures. In addition, all levels of government — federal, state, local and tribal — use census data as a guide for spending money on many different programs and services. 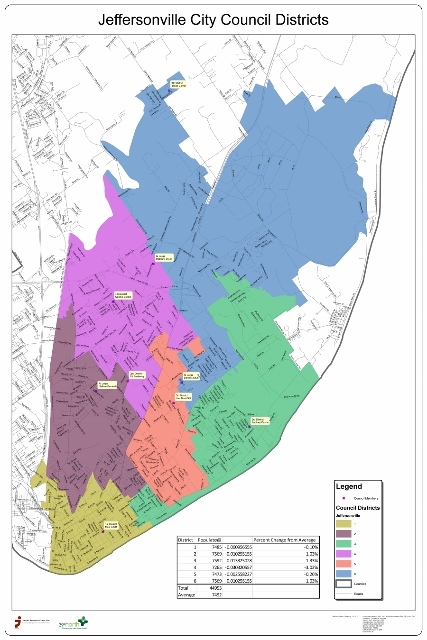 A large portion of district 6 (precincts Jeff 23, portions of Utica 2, and Jeff/Utica 19) becoming part of district 3. Jeff precinct 8 was taken from district 5 and added to district 2. All of Jeff precinct 5 and a portion of Jeff 6 was pulled from district 2 and added to district 1. Jeff 9 was taken from district 3 and added to district 5. Jeff 16 was pulled from district 4 and added to district 2. All of these changes resulted in 4.36% difference in population between the largest and smallest districts. These will be the districts until after the next census.